It’s completely normal to see a sailing boat crew running around the deck to shift weight and keep their boat on course during a race but if they suddenly started performing somersaults and backflips you might be a little more surprised. So when two of the world’s best freerunners, Jason Paul and Pasha Petkuns, were let loose on the Volvo Ocean Race sailing yachts something spectacular was bound to happen. 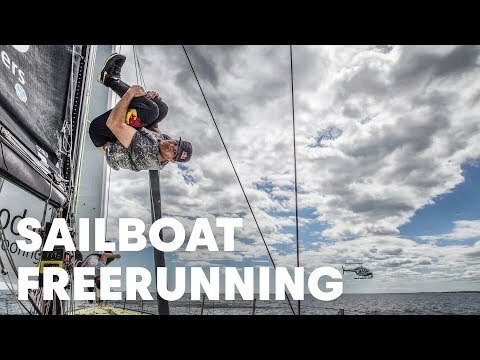 Filmed while the boats were docked in Fort Adam State Park in Newport, Rhode Island, USA on a stopover during the round-the-world race, the pair are believed to be the first freerunners to practice their sport on a sailing boat of this size. After warming up in the nearby Ft Adams, Petkuns and Paul then flipped, slid and tricked their way below and deck, between yachts and, most impressively, from deck to dock. Of course, that was never going to be enough for these thrill seekers but once the boats hit the ocean things became a little trickier. When under sail power the racing boats can tilt up to 45 degrees depending on wind strength making the surface very unstable for freerunning and the risk of tripping over a rope or catching an ankle on a piece of metal even greater. However, the resourceful Paul and Petkuns seized the opportunity to perform a huge rope swing using a line secured to the top of the mast, neatly ending the trick with a double somersault into the sea. Are you brave enough to slackline between two sailing boats?